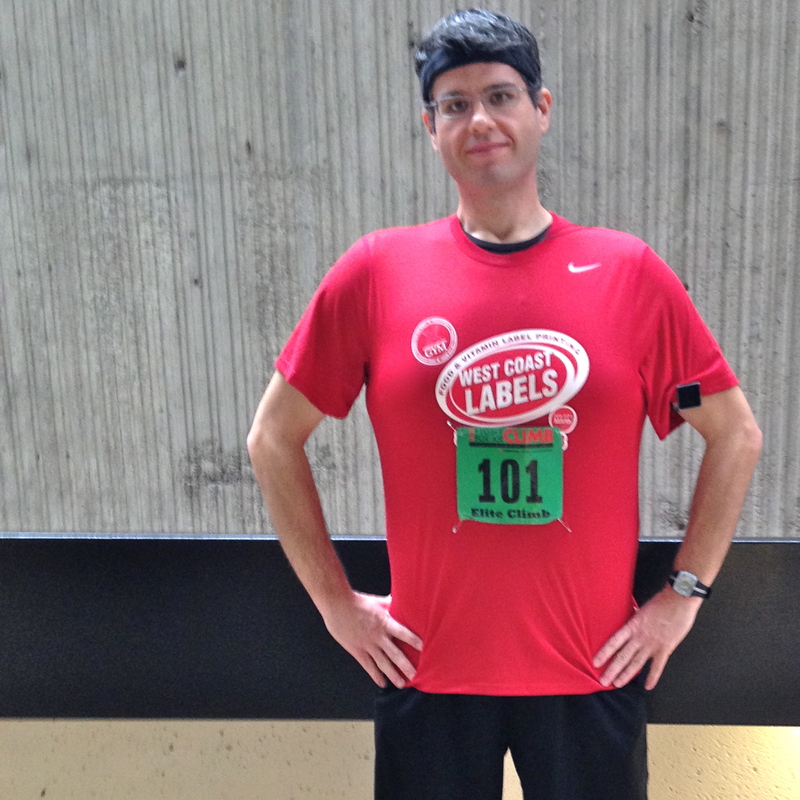 Race Recap: 70 Stories in Motown | Keep It Up, David! Yesterday was a brisk Michigan winter day, with snow everywhere and temperatures in the low 20s, and I started it with a little sprint at 6:45am. I dashed out to the driveway, barefoot and wearing only a T-shirt and underwear, so I could start the car and get the heat pumping while I got dressed. 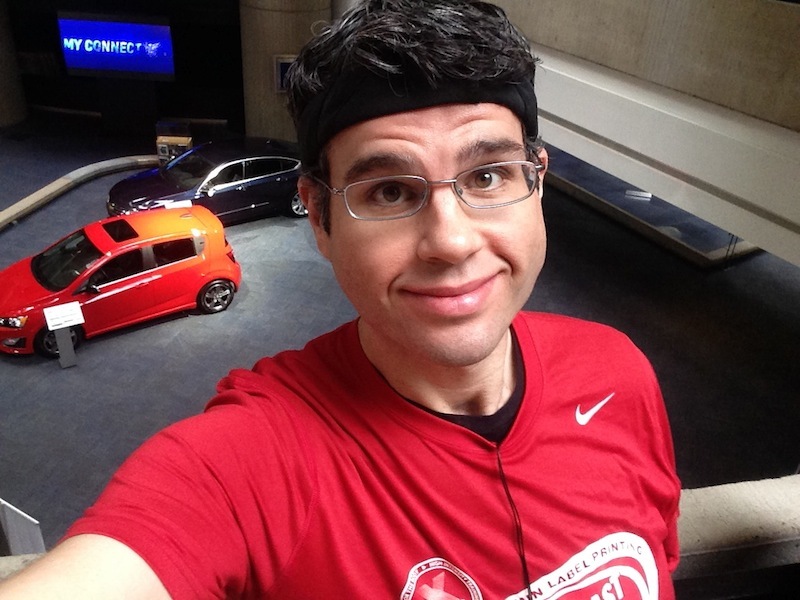 Crazy as that was, it paled in comparison to happened a few hours later, when I competed in the American Lung Association’s Fight For Air Climb in Detroit – racing up the stairs to the 70th floor in the Renaissance Center. 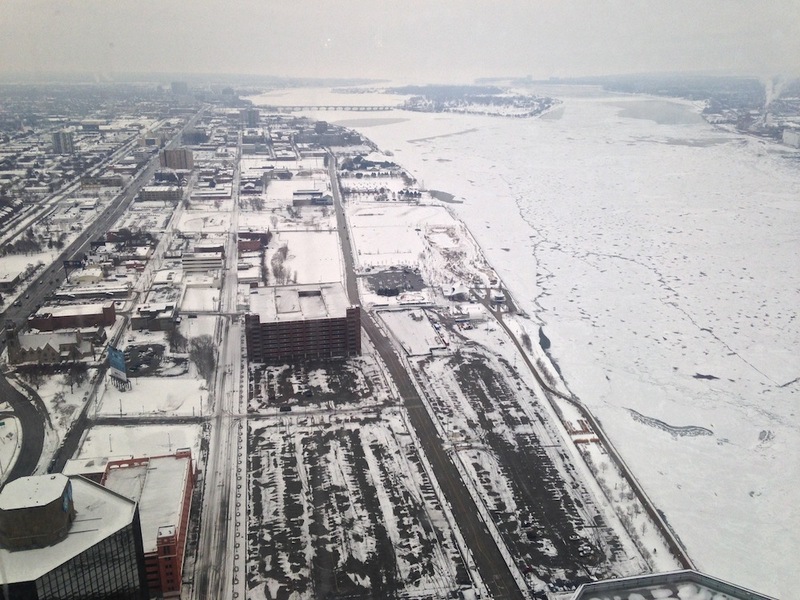 The Renaissance Center (nicknamed ‘RenCen’) is a 7-building complex right on the Detroit River, and the race was held in the stairwell of the tallest tower, a Marriott hotel. When you’re outside the complex, it can be hard to tell that the center tower is over 30 stories taller than the towers that surround it, but it is. 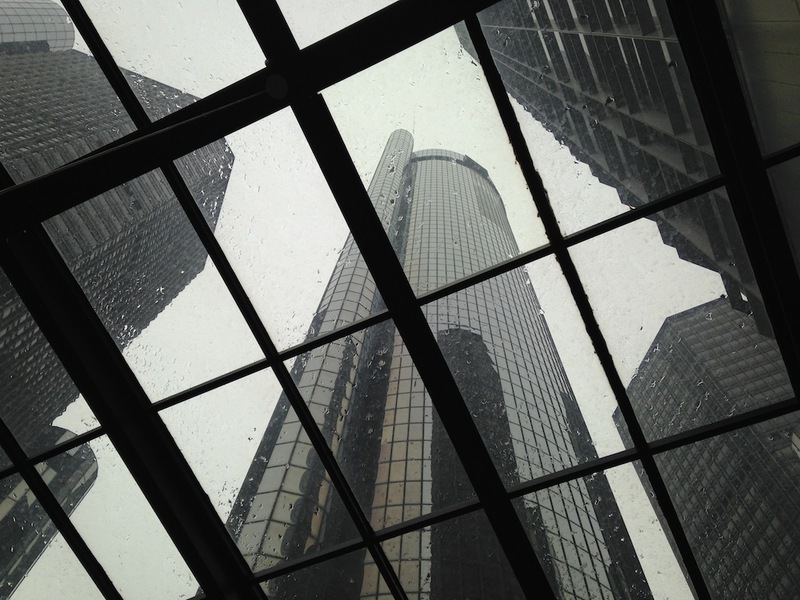 My favorite view of the tower is seeing it through a skylight in the expansive, multi-floor RenCen lobby. Does it look like a tall building? It is. It’s the tallest building in Michigan, and, for about 25 years, the center tower was the tallest all-hotel building in the western hemisphere. 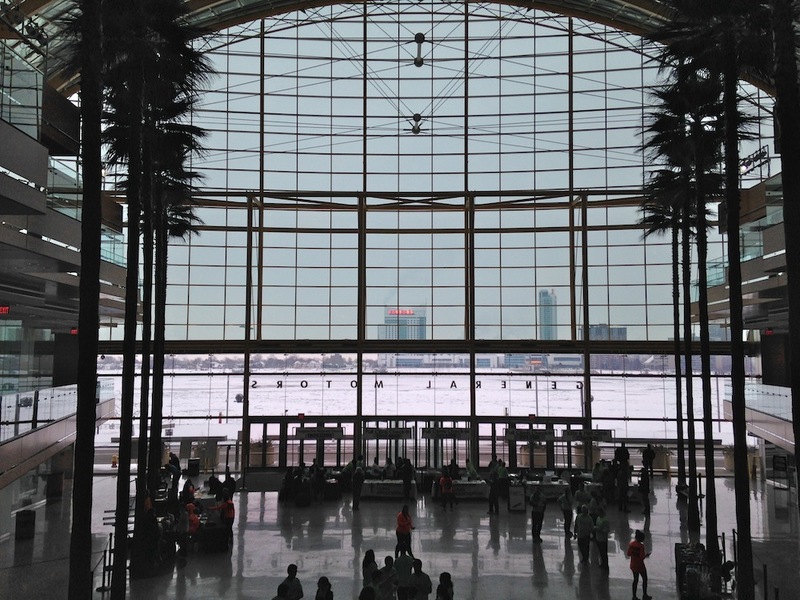 I got downtown in about 30 minutes, and had plenty of time to walk around the RenCen, stretch, jog a couple laps around the lobby, and hang out in the Wintergarden, a huge atrium with a wall of windows facing the nearly-frozen-over river. Those buildings in the distance, by the way, are in the completely different country. That’s part of the skyline of Windsor, Ontario, Canada. This was a very big race. Well over 2,000 people had registered, and they had an organized system where they brought people to the start line in groups. I was in the Elite group, so I was one of the first people to climb. Elites also had special green bibs, while everyone else had white. Good ol’ lucky number 101! They were supposed to start letting people in the stairwell, one every eight seconds, shortly after 9am. But there was some sort of hold up, and even though there were only about 30 people ahead of me, I didn’t get to the start line until almost 9:30. I’ve been in the RenCen a bunch of times, starting when I was a kid, but I’ve never been in the stairwell, and I didn’t know what to expect. As the delay lingered on, I started feeling increasingly nervous, in addition to feeling excited. 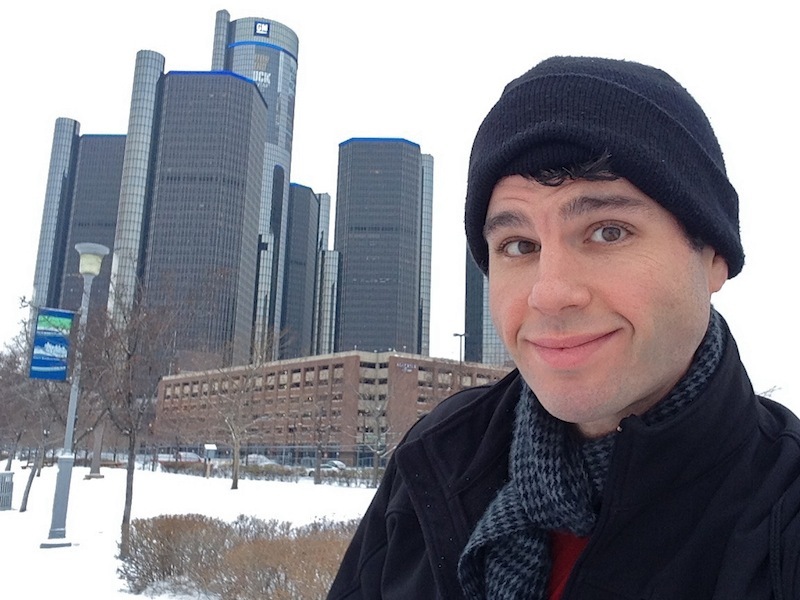 Oh, did I mention that the RenCen is owned by General Motors, and it’s their world headquarters? That explains the cars in the background – the lobby is full of them. And into the stairwell I went. I wish I could say my nervousness was completely unnecessary and that I tackled the stairwell easily, but I can’t. The RenCen stairwell immediately tossed a couple wrenches my way that I was not expecting. I was caught off guard, and it completely frustrated me. 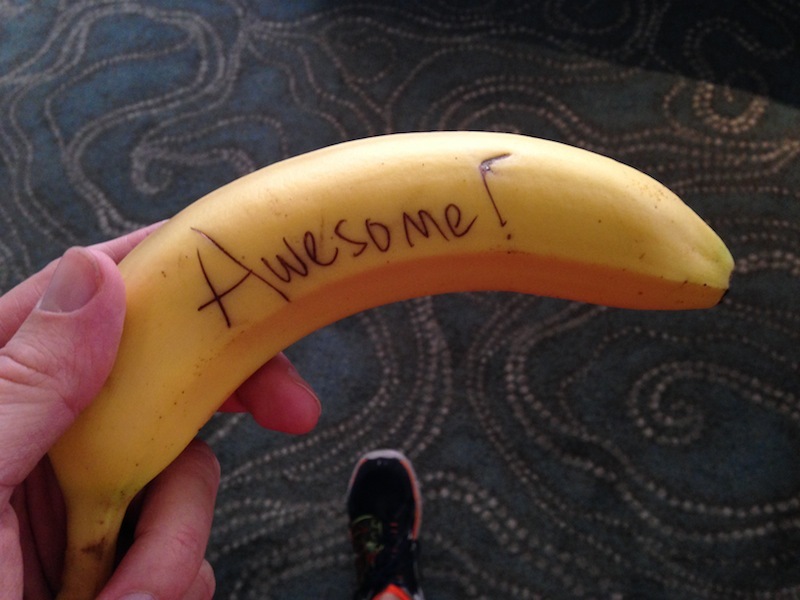 RELATED CONTENT: Check out all my race recaps here! There main difference between this stairwell and most of the others I’ve raced in is that the RenCen has a concrete wall rising up the center of it. You can’t see any flight of stairs other than the one you’re on, which makes it hard to spot people ahead and behind you, which can make passing (or getting passed) tricky. And with people entering every 8 seconds (as opposed to every 15 or 20), there was a lot of passing. Even more problematic was the handrails. I’m used to using the inner handrail to pull my body around on the landing to the next flight, but these handrails ended just before that center wall did, so there was nothing I could use to help propel myself around the corners. Any momentum or rhythm I had by the end of a flight was instantly lost. Since both those obstacles presented themselves as soon as I started climbing, I had no choice but to deal with it and climb. So I climbed. I put some extra oomph in at the beginning, thinking I wanted to make up for time I was losing on the landings. I pushed myself. I tried to ignore the floor numbers, and after a short while, I guessed I was coming up on floor 12. It turned out to be 21. That’s when I realized that every landing was a new floor. There weren’t landings halfway between each floor, which is common in high-rise buildings. That made the climb seem to go by quicker, and I was grateful. Finally, something in my favor! Even though stairwells may differ, my objective in each race is the same: to get to the top as quickly as possible. 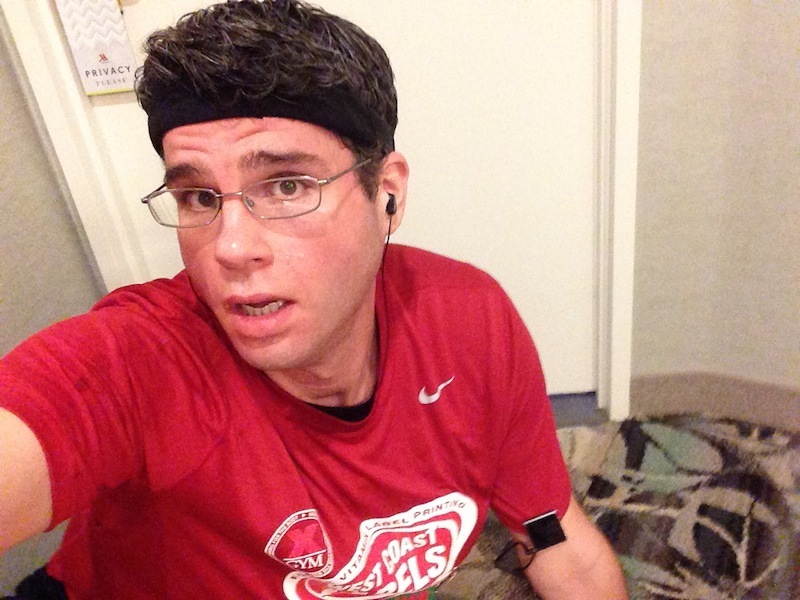 Fatigue started setting in around the 30th floor, but I kept pushing. My heart rate stayed in the 170s the entire time, topping out at 178 near the end. After heading back down, I went and found my friend Laura, who was also racing. 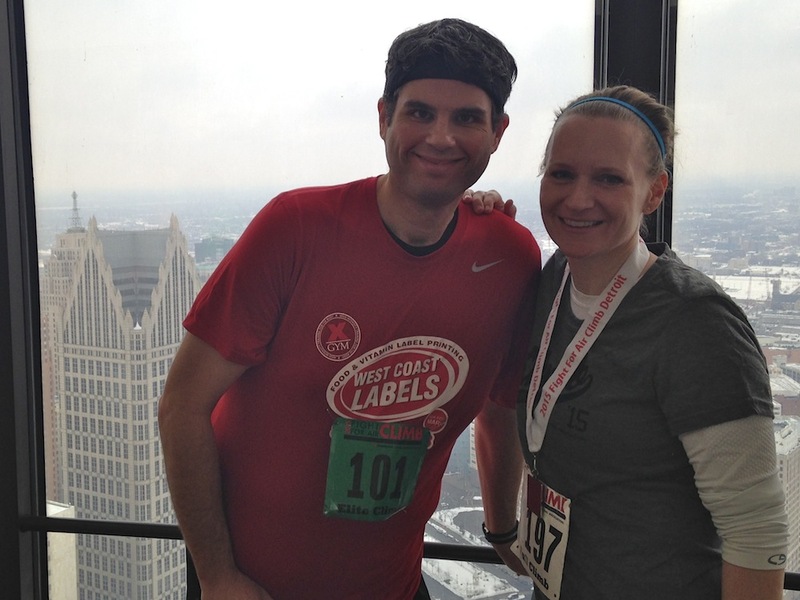 This was Laura’s third RenCen race, although she hadn’t done it in a few years. She actually gave me lots of advice before my first-ever stair race (which I shared in my recap from that race), and I was so excited when she agreed, a few months ago, to race again this year. RELATED CONTENT: Climbing 320 stories in two days. 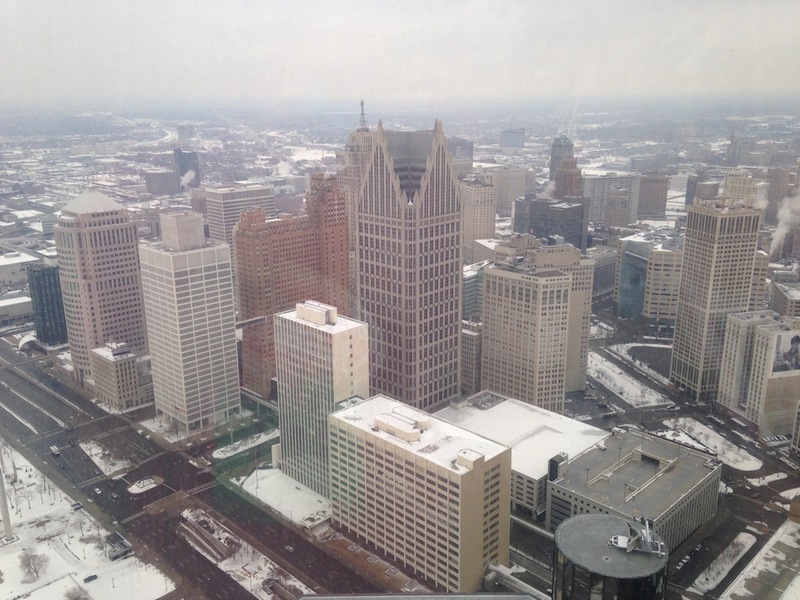 When Laura finished, we headed back up to the top of the RenCen – this time to the restaurant on the 72nd floor, called Coach Insignia. My father and I dined here four years ago (it’s delicious), and it has awesome views of the city. I finished 144th overall, out of 937 that finished the full climb (there was a half-climb option, too). I was 96th out of all men (336 total). I was 4th among all participants who came from outside Michigan (trailing folks from Ohio, Wisconsin, and Canada). I was 1st among all participants who came from California*! I WON! *I was the only participant from California, but that’ll be our little secret. 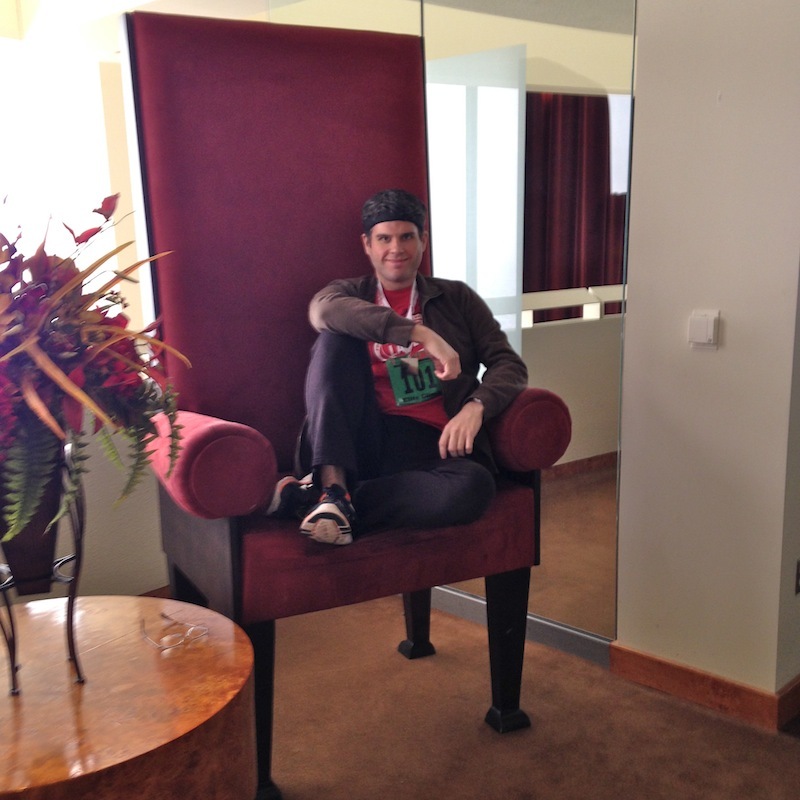 Being 6’4″ and almost 250 pounds, there’s not much that can make me look small, but that chair does it! 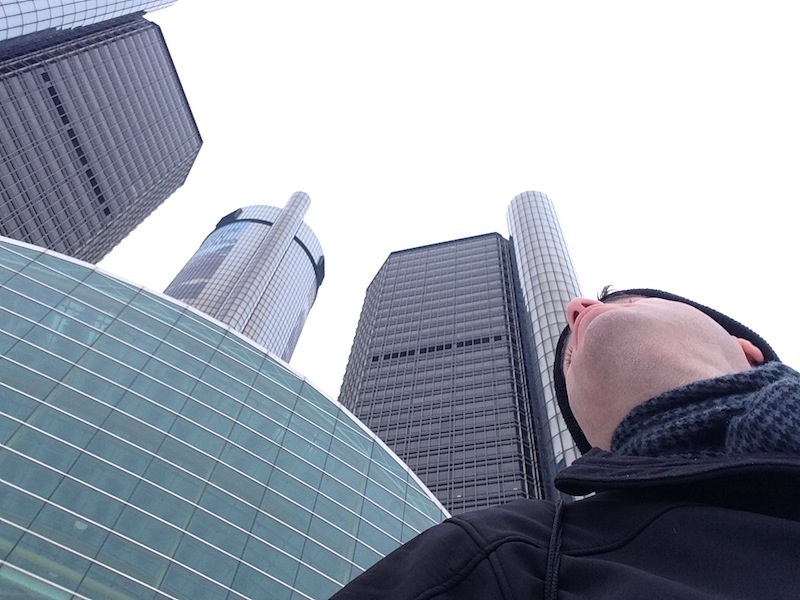 With the RenCen under my belt, I can add Detroit to the list of cities where I’ve raced up a skyscraper. It’s the 7th city on that list, and by the time March is over, I’ll have added the 8th and 9th (Phoenix and San Francisco). That’s a lot of cities… and a lot of races! PS: My parents were my sole sponsor for this race, and I want to thank them for their amazing donation to the American Lung Association, and for all their support in general. I love you both! This entry was posted on Sunday, March 1st, 2015 at 11:44 pm and is filed under Uncategorized. You can follow any responses to this entry through the RSS 2.0 feed. You can leave a response, or trackback from your own site. Eleven minutes! Can’t even imagine that. There must be wings on your back. I’m visiting Dana Point and taking stairs down to the beach. I haven’t noticed any weight loss but my jeans are getting looser. Have you noticed that stairs have a bigger impact on your body fat? You are looking leaner. Thanks! I have yet to check out the OC beaches – I know there’s a few impressive stairways down in that neck of the woods! You know, It always seems like my body fat is redistributing itself, because I’ve noticed the same thing… and I don’t know if I have stairs to blame/thank or not. I haven’t had body fat tested in a while (quite possibly a year and a half)… maybe I should get it done! Thanks, for the reply, David. I think the body fat element is important especially for people who are working out faithfully yet not seeing their weight go down. That can be so discouraging. I visit Dana Point, Salt Creek Beach on the strand. Great stairs and not terribly busy. I’m currently in flat Dallas and thinking about doing step classes. Congrats on another successful climb! I always enjoy reading your stories about these events; how you prepared, what you were thinking, how you felt when you finished, etc. It’s all very exciting and I am very proud of you! Thank you Joanne! See you soon. 70 stories in 11 minutes, that’s AWESOME! We’ll be cheering you on in person when you run up 555 California (aka “the triple nickle” building). Also high five for your five year anniversary of your weight loss journey. Keep climbing David! See you in a few weeks. 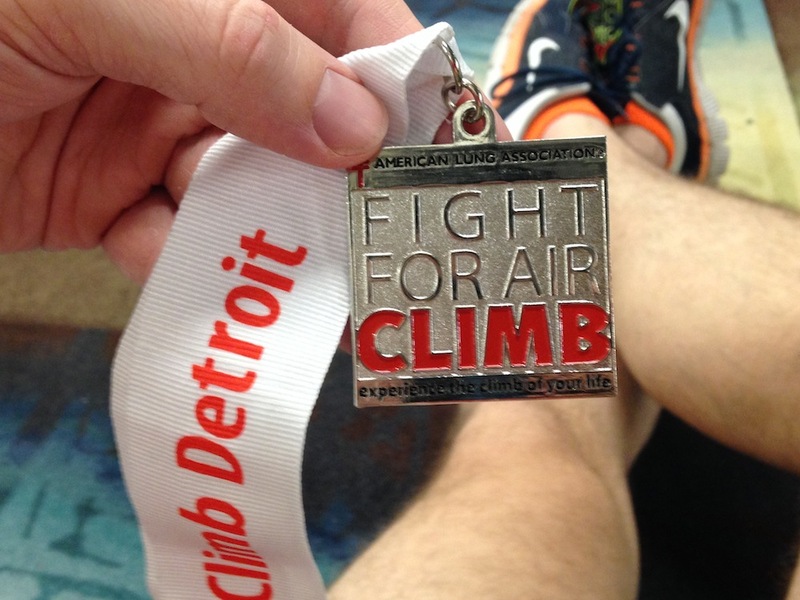 David, I am about to do my first ever Fight For Air Climb in February at the Detroit RenCen. I am looking for any and ALL training tips available. How to train, what to do to train and what am I to expect? I am very fearful of this event, but I’m more fearful for my daughter with Interstitial Lung Disease. We are doing this for her! I do train 4-5 days a week but I just don’t fee like anything can prepare me enough for this event. I don’t have access to a stair stepper, however I do have just about everything else here at home to train. Any and ALL training tips and preparation will be greatly appreciated!!! Thank you so kindly!! Ha ha ha. Gotta admit I’m quick at the draw! 😉 I just did my first ever 5k today and was timed at 32 mins. I feel that’s pretty decent. I know I could have done better, but being my first, I wanted to pace myself. I have another one on Saturday in Detroit “the mustache dache”. Should be fun. I’m going to aim for 30 flat. Wish me luck ;). I’ll sit tight for your advice on training for the climb! !